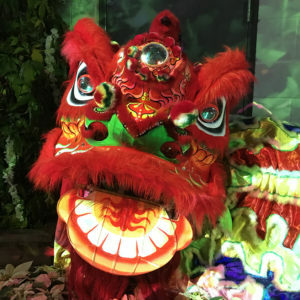 Welcome to the Year of the Dog: Chinese Lunar New Year begins today. It’s the most important holiday of the year in the Chinese tradition. The new year is a long celebration that begins with a reunion meal on New Year’s Eve (that was last night, the 15th of February) and runs this year through to the 2nd of March, which is Lantern Festival. There are traditions for each of the days in between, traditions which vary across cultures within China. But certain things are common throughout the new year festival: the color red, an astonishing amount of exploding fireworks, gifts of money in red envelopes, and an abundance of good food. As for Dogs (at least in terms of people born in Dog years), it is believed that they share some general characteristics. They make great friends, and are always ready to lend a hand. They are very loyal, not just to friends, but to family and work, as well. They are honest and just. They are often popular, despite a healthy dose of worry and anxiety that they hide from others. Be that as it may, they are resolute, and can typically overcome their worries once they decide to do something. Dogs are very compatible with Rabbits, Tigers, and Horses. Oxen and Goats, not so much. Dragons, like me, clash strongly with Dogs. Neither trusts each other and intense arguments are likely (apparently, I’ve never met a Dog). There are five elements associated with the years of the Chinese Zodiac––Metal, Water, Wood, Fire, and Earth. This year is the year of the Earth Dog, the first time since 1958. Besides being Chinese New Year, it is also Losar, the Tibetan New Year festival. Seth’s parents are Buddhist. For Losar, they have cleaned the house and cleaned the shrine room. The cleaning is part of the preparation for the new year, especially in the kitchen, where special foods are made for the celebration, much like they are for Chinese New Year. This is, as well, a time to visit friends and relatives and to buy new clothes, settle debts, and resolve disputes. The prayer flags are replaced at Losar, too, with new prayer flags that will flutter in the wind… but my in-laws are in Maine, and Doreen says it’s too snowy to get out there to change the flags. We need to be practical about things, after all. 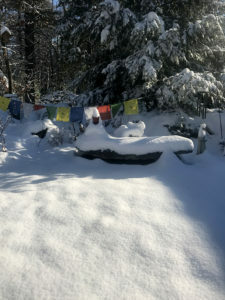 The old prayer flags still are prayers, still just as beautiful in all that snowy pine forest. If it was up to me, I’d wait to change the flags, too. Once Lunar New Year is here, spring, we know, can’t be all that far away. Sometimes, as the events of a day unfold, the things I write about seem terribly unimportant. Really. I write about food and booze and the proper time to take down your Christmas tree. But this is what I do, and so I do it. 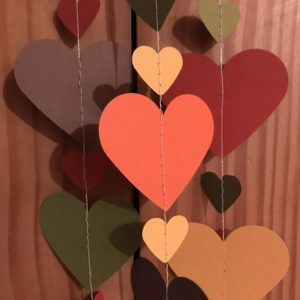 I began writing this chapter about Chinese Lunar New Year at 3 in the afternoon on Wednesday, Valentine’s Day. I was having two new tires put on the car, so I sat on the sidewalk outside the tire shop and I got to work. Between the time I began and the time I had finished the first paragraph, a kid with a semi-automatic weapon took 17 lives in a high school in the neighboring county. This is not the way things are supposed to be. In 1982, I graduated from Deerfield Beach High School, 14 miles due east from Marjory Stoneman Douglas High School. My niece went to Marjory Stoneman Douglas in the mid aughts. I worried about a lot of things in high school, and I’m sure Stephanie did, too, but neither of us ever worried that we might be shot in school. A lot has changed since then and much of it makes little sense. We have brought this terror upon ourselves and worse, upon our children, and they suffer through our debate. I suspect nothing will be done, not by us, not now. We are, sadly, entrenched in a period in this country of neither reason nor hope, and there seems little chance of the discord being bridged. My hope, though, is that our kids will have the spine to do what we will not. Top image: A dragon puppet that we stumbled upon at this year’s South Florida Fair at the Palm Beach County Fairgrounds west of West Palm Beach. It is a Dog Year, but dragons are common symbols of the new year, and this dragon wound up being the cover star of our Convivio Book of Days Calendar for February this year. Welcome to the Year of the Monkey. We are at the start of Lunar New Year, or Chinese New Year. Twelve animals represent the years in the Chinese tradition, and each animal comes around every twelve years. And just as the weekend culmination of Carnevale snuck up on me yesterday, so has Lunar New Year. Each year I think to myself, Seth and I are going to stop in at Joy Noodles in West Palm Beach; we’re going to sit down with Joy and get the details on this fascinating holiday. Joy is from Thailand but she is of Chinese descent, and I know I can learn a lot from her. But we go, we eat our noodles, we order the special mochi that she makes for dessert during the New Year and Joy is always so busy, it’s impossible to get her to sit down. And so I still don’t know much about Chinese New Year. What I know is the New Year celebration begins in earnest today, and it goes on for many days, and there are different facets to it. Some days are meant to be more family oriented, some more public. And since it has snuck up on me, I hope our friend Shin Yu Pai won’t mind me using her imagery again. 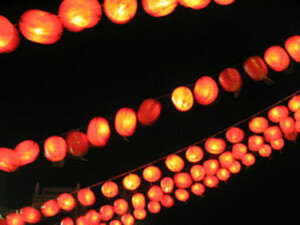 She shot this photograph at Lantern Festival, which is part of the Lunar New Year festivities. Shin Yu is a wonderful poet; we got to work with her on a book of poetry called Works on Paper (Convivio Bookworks, 2007). We completed the work on that book during Lunar New Year, in fact. It was the Year of the Boar. I am no tech wiz, so all I will tell you is this: If you click on it, you will download a 6-second video that Shin Yu shot during that same Lantern Festival. It’s a joyful six seconds. And that’s what I wish for you and all of us: Joy. (Huh. I just realized that has been a constant theme throughout this writing. I love when that happens.) Happy New Year.